My buddy forward this video to me and I wanted to run it by you. I have always been a great believer in your technique and methods. In your technique the more club head speed you want to generate you simply turn the hips faster and the arms remains powerless and is just there for the ride. This guy say it is not the case and he proves it here http://www.youtube.com/watch?v=4FlhrBGqnjc. Can you please comment. First his hips did move in the backswing. If you freeze it at the top his belt buckle is over is right toe plus he has a 90 degree shoulder rotation. It is impossible to turn your shoulders to 90 degrees with zero hip turn. Next, he just did a practice swing. This is not reality. I do not say you have to use your legs and hips to hit a golf ball. 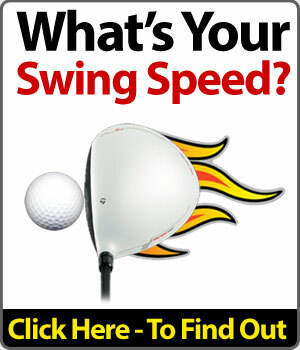 I say you WANT to use them because you can increase the clubhead speed. The speed comes from the lagging club and the looseness of the wrists. This arm unit to be connected to something. This something is your rotating body. Your body only moves at approx. 2.5 mph in a golf swing. 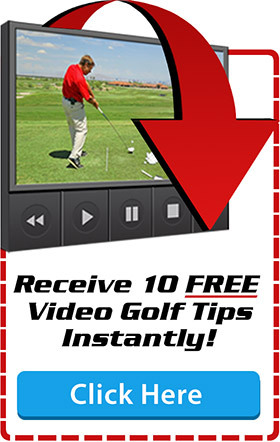 If you can move it only slightly by using your legs faster you will create more clubhead speed. Next, every long driver in the world moves his hips. Why would they do this if it did not create power in the swing? Next, he only got 109mph in a practice swing. Using my legs and hips I got 116mph while hitting a golf ball. Finally, how would Iron Byron hit a ball father? Answer: Turn up the speed of the motor which represents the golfers legs. Great summary on balance. When I get to the top with my weight on my inside right foot it feels like I’m sitting down slightly while I load the weight. Is this the correct feeling? I’m keeping my rt knee flex constant. The drill I do is to take it to the top and bounce on this back leg which feels like I am sitting. When I see people straightening the back leg as the go back I tell them to feel like they are sitting down 1 inch. So, sitting is a good thing to feel. Just don’t sit too much. Clearly this loading is the source of power. My driver swing speed is up 10 mph with no additional effort when I load the instep. Hi Paul, I really like this tip on balance, it’s so important. Also have been working on your tip about exaggerating turning the belt buckle to the target. When I do this I find myself on the the straight left pivot leg with my knee touching the legs, and I can’t say how it happened so quickly. I know it feels like my belt buckle is pointing to the target before my arms have even moved, however I am sure that is not reality. That has been a great tip for me. So you needed more rotation to get the legs touching. Glad you are feeling it now. This is a very important position. Great lesson,Paul,but it ‘s too easy when taking the Weight on the right insole to overdo it and move in a sway. To prevent this I kick in the right knee When getting in the backswing and keep it such : I gather from your comments you don’t like that .I have a natural tendency to sway ,mostly with the fairway woods ,never with the driver or with the irons .If I don’t “kick in the right knee ” what should I do ? 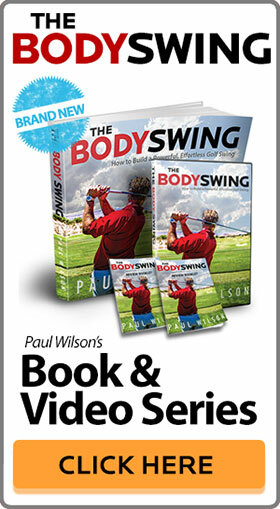 If you kick it in too much it creates too much resistance which may reduce the shoulder rotation, shorten your swing or actually make you sway. Just don’t knock it in too much. Today was difficult as the ball would not travel any further than you could carry. This made me think of what I needed to do to carry the ball farther. It did not work but I had a feeling of easyness, a swing which was what I should have had, Since I could not compete with my friends I concentrated on your tips. It improved my feeling of what I should have done before. Thanks Paul ! I’m not exactly sure what you are saying here. You were hitting it too high and not getting roll or just not hitting the ball very far? Hi Paul, I find on my follow through position, my left foot (I play right handed) ends up rotating outwards towards the target (if it starts at address at 12 O’Clock, it finishes at an equivalent maybe 10.30). I can find an end balance this way, but am wondering if this is signalling something I’m doing wrong? This foot needs to be turned out at address. If it is straight you can’t turn unless you twist the foot. Also, the foot would be twisting if there is not enough weight on it through and past impact. If more weight is on it it can’t twist. Great tip .My only question since I started two years ago I was told not to move your head. Can you explain?? You do not keep your hear still in the golf swing. Jim McClean did and article in July 2001 Golf Digest. Pros move their head on average 2.6 inches. Amateurs .7 of an inch. A still head does not mean perfectly still.